There's no telling where a writer may look for inspiration -- to enrich the story of Leopold Bloom, Joyce looked to Homer, while, in order to flesh out Humbert Humbert's affliction, Nabokov simply looked to Home-s (containing children). Looking no further than hamburgers, The Hamblogger. 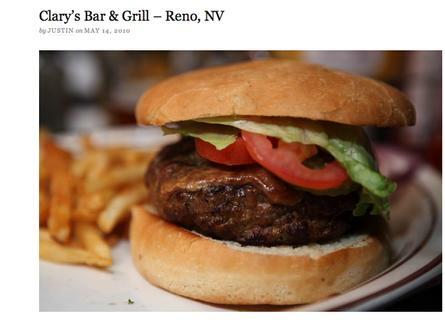 From a pair of photo journalists (one in SF, the other in LA), The Hamblogger's a caringly curated burger review site, populated with pro-level photos, well-formed prose, and a grub rating of 1-5, bolstered by pointed knowledge on what's best to order where (when at Mel's don't miss the ice water). Locally, The Hamblogger has hit spots ranging from Trueburger (4 out of 5 'bulls', in "a nice enough part of Oakland so you don't have to worry about getting caught up in a...drug deal gone bad"), to Red's Java House (naturally), to Ganim's Market in Potrero, where you can pick up beer, booze, and a double quarter pounder that looks more like a double half pounder, which is what, like, 3 lbs of meat, depending on where you put the remainder? Action outta SoCal includes a place in Palm Springs that has no restroom ("you have to walk up the street, down an alley, through a gate...look, just pee before you arrive..."), and Fresh & Meaty in LA -- where "thick bulletproof glass separates you from the employees" -- where's your nice enough part of Oakland now, SoCal? The Hamblogger's planning on expanding coverage with more writers across the country, and have already taken their show on the road to Boise, ID, and Reno, where they tell of a one pound burger injected with peanut butter -- for pointers on how to ingest this much food, look no further than Homer.